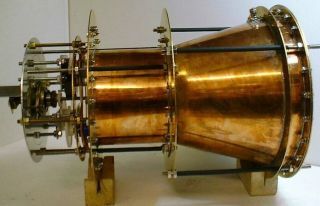 The EmDrive engine, which is designed to generate thrust by bouncing microwaves around inside a cone-shaped chamber. Good news for all you EmDrive enthusiasts: A new study suggesting that the seemingly impossible space engine may actually work has passed the peer-review process. The study — which was led by physicist Harold "Sonny" White, of NASA's Johnson Space Center in Houston — found that an EmDrive design generated small amounts of thrust in the lab. These results were leaked online recently, and now the paper has been published, in the American Institute of Aeronautics and Astronautics' Journal of Propulsion and Power. Development of the EmDrive was begun by British scientist Roger Shawyer about 15 years ago. The engine works by bouncing microwaves around inside a chamber; it requires no propellant and could therefore usher in a new era of superfast and efficient spaceflight, advocates say. There's just one little issue: The EmDrive shouldn't work, if you put any stock in Newton's Third Law of Motion ("for every action, there is an equal and opposite reaction"). The EmDrive doesn't blast anything out the back, so just how it produces thrust (the equal and opposite reaction) is a mystery. The new study is just a lab test, and it doesn't prove that the EmDrive definitely works — White and his team couldn't rule out all sources of experimental error, for example — so don't let visions of EmDrive-powered spaceships fill your head. However, its publication is the latest in a series of recent steps suggesting that the technology may be more than a sci-fi dream. Read more about the EmDrive and the recent lab test here.